I’m very disappointed by this BSN meeting. This event is organised every 2 years so you might expect some quality standards. Well, don’t expect too much … (don’t expect anything, in fact). Morning talks were ok, nothing more: it was not better nor worse than any other congress. 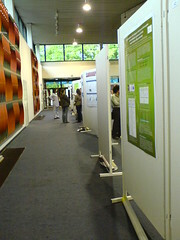 But the poster session was not organised at all and there was no support from senior scientists … Moreover, authors of about 1/3 of posters didn’t even deign to come and hang a poster! Most of senior scientists left before the afternoon poster sessions (usually, questions from seniors are more useful than other students’ questions); maybe 2-3 seniors were left (for the whole Belgium!!!). And the final touch, lunch was not free (not even sandwiches!) although we paid 45€ for registration (free for members – membership is 12€ per year for students). Instead we were redirected to the UAntwerp canteen … Are they not smart enough to find a sponsor? I think it would have been better to attend the Neuroinformatics Meeting only. We decided to leave at 16.00: on the 200 people there at 14.00, approximately 20 were left, most of the posters were already removed and no one was there anymore 1) from my lab 2) to have interesting discussions (apart from the weather topic). It’s sad for the last speaker but, hey, if the meeting organising committee is treating us like s..t, what do you expect? We spent at least one day designing our posters (I know people who spent the whole week on it!) and no one is there to discuss about it? We spent hours on highways and traffic jams trying to enter Antwerp at 9.00 to be at the same level as inept people not even coming to hang their poster? I’m sure they even didn’t designed their posters. And the result is the same for everyone: 1 line on the cv. I’m really disappointed. Note: Alexandre Dulaunoy already left a comment on one of my photos of the meeting on Flickr.